SAW - Special Access to Windows - is a programmable on-screen keyboard. It is a powerful tool for providing Access to the Windows operating system for people who need alternative Switch or Pointing device input options. The new SAW 6 version - supported by the AEGIS project (http://www.aegis-project.eu/) - is now available. It is fully Windows 7-10 compatible, supports Unicode, includes its own "Blade" word prediction and abbreviation expansion engine, can interact with the CCF-SymbolServer for graphic symbol support (http://www.conceptcoding.org/), and adds several other features to make creating interfaces easy for those who use alternative inputs. 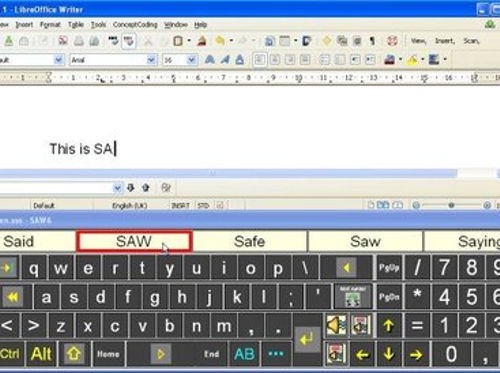 SAW - Special Access to Windows - is a programmable on-screen keyboard. It is a powerful tool for providing Access to the Windows operating system for people who need alternative Switch or Pointing device input options. The new SAW 6 version - supported by the AEGIS project (http://www.aegis-project.eu/) - is now available. It is fully Windows 7-10 compatible, supports Unicode, includes its own "Blade" word prediction and abbreviation expansion engine, can interact with the CCF-SymbolServer for graphic symbol support (http://www.conceptcoding.org/), and adds several other features to make creating interfaces easy for those who use alternative inputs.